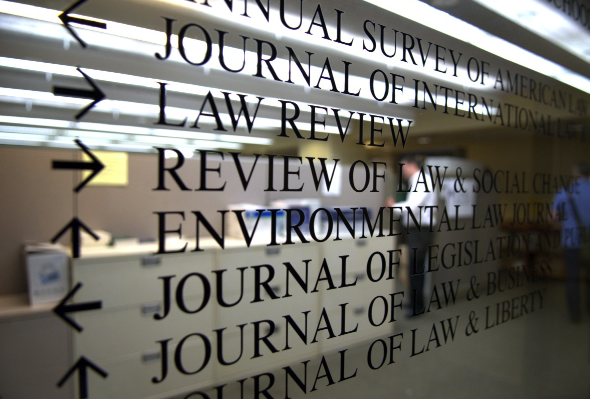 Being on a journal is a great way to have a smaller community and support system within the hustle-and-bustle of NYU Law. What we have in common—our passion for international law—combined with our diversity beyond that (our backgrounds, interests, and professional goals) make us a vibrant, dynamic group with something for everybody who finds themselves here. You want stimulating intellectual conversation about the International Criminal Court? We got that. You want the best Halloween party this law school has to offer? We got that, too. I serve on the board of my journal as Senior Symposium Editor, and it’s been a great opportunity to not only shape the overall direction of the journal, but also to take on a very fulfilling leadership role. After months of preparation, my journal’s annual symposium was in October, and planning and running it was a huge learning experience. At the end of the day, when a leading scholar tells you they’ve enjoyed the event, it makes all the work worth it. Three years of law school can go by very quickly, and being on a journal is a great way to make a more permanent, positive contribution to the NYU Law community. For example, you can get your own student note or book review published, or assist in editing the work of major academics. Also, as a 3L journal member, you have a great chance to encourage 2Ls to keep the momentum going, and to give them guidance as they complete their own work. In the end, I think that oftentimes what you get out of your experience depends on what you put into it. If you are willing to put in the time and work—even doing unglamorous tasks like fixing footnotes—then being on a journal can be a very rewarding and enjoyable experience. This entry was written by Amanda Ploch '12 and posted on November 16, 2011. How about the real non-BS reason: Employers will frown upon you if you don’t have journal experience even though the experience is mostly just another timesuck that doesn’t accomplish anything nor import any real skills. Thanks for your comment. I think I have several friends who would wholeheartedly agree with you and roll their eyes if they read my post. So I’d like to elaborate a little bit. It is of course true that employers highly value journal experience, especially journal leadership experience, and students know this when they apply- I certainly did. It is also true that many students strongly dislike the time they spend on a journal, and that many tasks that one might do on a journal may not necessarily result in skill-building per se. However, the same could be true for many other activities one could engage in during law school (like being in a clinic, or being a research assistant for a professor), or activities in other academic and non-academic settings. And the fact that these things hold true for some students does not necessarily mean that others students- like myself- don’t genuinely enjoy being a part of a journal. Valuing an activity on the one hand, and also getting a “resume boost” from it, are not mutually exclusive. Sure, some people might hate being on a journal, and are only on it because it improves their employment opportunities, but what’s true for some people isn’t necessarily true for all. As for skills, the skill-building you get on a journal can be highly dependent on what positions you take, and what journal you are on. For me personally, I believe that my experiences in communications, event planning, and editing that I got in my journal position are a benefit to me. I haven’t enjoyed every single thing I’ve done for my journal (and I think most students would feel the same way), but by putting in the time with those less-desirable tasks, I’ve gotten the chance to do other things that I do really enjoy. Many worthwhile experiences involve a mix of the good and bad, a mix of time well spent and time that could have been better spent- I think that’s to be expected with most activities, including many that are still considered valuable in the end. Lastly, I want to reiterate the strong sense of community that I enjoy so much. Every journal has a different social atmosphere, and I happen to enjoy mine. I’ve spent so much time hanging out with journal members laughing and having fun. Even when we’re talking about things that have nothing to do with the journal, it’s our common membership on the journal that has helped create the space for these friendships to grow. Of course my journal experience is a line on my resume, but- no matter how genuine or representative you think this post may be- that doesn’t change the fact that for me, when I look back at my time on the journal, I think I’m going to be largely thinking about the fun, hilarious, challenging, and rewarding experiences I had.